Still recovering around here from the big reveal of DC Comics's Spring 2016 collections, but the monthly list is out -- hardcover and trade paperback collection releases for December 2016/January 2016 (posted August 2015) -- and there's some interesting material on it, especially for we fans of uncollected 1980s/1990s comics: Marv Wolfman's Deathstroke, the Terminator, Mike Grell's Green Arrow, John Ostrander's Suicide Squad, Chuck Dixon's Nightwing, and Garth Ennis's Demon (with Hitman). Just the fact that the creators' names are so synonymous with these titles suggests how special each one is. Before we get into my picks for this month (and you can see the full list at the DC Comics site), I did want to mention that Geoff Johns and John Romita Jr.'s Superman: The Men of Tomorrow just came out, no longer numbered "Vol. 6," and if the spring solicitations hold up, Gene Luen Yang's first Superman collection will be renumbered "Vol. 1." I guess I didn't expect that DC would just keep on with the New 52 collections numbering indefinitely, as publishers across the board are somewhat adverse to high-number collections, though it is an oddity to see the series' individual issue numbering keeping on even as the collections switch over. Obviously, we've seen the same thing over in the Batgirl title. Compare to the current Deathstroke, Teen Titans, and Suicide Squad, all of which were started over with new issue #1s; I wonder if this reflects a hesitation on DC's part to re-renumber Superman, whereas something like Teen Titans is OK, or if they've found that re-launching series like Teen Titans doesn't bring the discernible jump in sales that starting a new team on an existing book does. I can't imagine DC will renumber the Batman collections until Scott Snyder and Greg Capullo leave (hopefully never), but I wonder if, say, Wonder Woman and other series will get new collections numbering when their teams change, or if this was specific to the Superman title somehow. As the tie-in trade to the upcoming Dawn of Justice movie, this trade is surprisingly compact and modern, which incongruously I don't mind that much -- this is a trade someone interested in current DC Comics could read and get a fair primer on the current DCU, whereas Silver Age or etc. stories wouldn't fit that same purpose. It is, specifically, Batman: The Dark Knight Returns #4, Batman #612 (an issue of "Hush"), Batman #35-36 (two parts of "Endgame"), Superman/Batman #32 (maybe the only odd one, part five of Mark Verheiden's Enemies Among Us) and #78 (a Joe Kelly one-off), and Justice League #2 (from Origin). What's missing is a Superman/Batman team-up a la something from No Man's Land or Dark Knight Over Metropolis (thankfully already collected), though likely that's not really the point of this particular collection. What worries me in general is that the zeitgeist will gain some idea of Batman and Superman as enemies or a "who could beat who" mentality, when that's hardly the actual reality in the comics. The final Detective Comics trade before Convergence and the final with Francis Manapul on art (that didn't last long, unfortunately), with issues #35-40. The solicitation includes the Futures End issue and also Detective Comics: Endgame; other series have omitted their "Endgame" specials, so I wonder if this one'll actually be in there or not. With no disrespect to the Matt Wagner miniseries, which I've never read but I'm told is quite good, it seems a shame there's no modern-ish, in-continuity story DC can go to for a teaming of DC's Big Three in anticipation of Dawn of Justice, turning instead to an essentially Elseworlds (or out-of-continuity) miniseries. Among good Trinity stories, Kingdom Come is obvious but doesn't meet the criteria either. Best I can think of is Jeph Loeb's Batman/Superman: Supergirl, which in recently being re-branded as Supergirl probably can't also be used as a Batman/Superman/Wonder Woman book. I'm not sure if it's Gotham or what has emboldened DC to collect these lesser-known mid-series issues from the Ed Brubaker-era Catwoman series, but it's a strange delight to see them collected. If this trade does indeed collect issues #38-49, then the next volume will start to get into the material previously collected in Catwoman: The Replacements. From then we're into some sometimes-weird, sometimes-well-done issues by Will Pfeifer that involve Catwoman having a child, among other things. On title alone, there were a bunch of really exciting things this could collect. That it's apparently the somewhat-rushed Wedding Album is a kind of a disappointment (not in the least because Superman didn't have powers at that time), but if you haven't read it, here's the wedding of Clark Kent and Lois Lane for you. My fervent hope is that Dan Jurgens's new Superman: Lois and Clark series doesn't just use a Superman and Lois Lane who are married kind of like the pre-Flashpoint Superman and Lois, but rather that Jurgens specifically writes the actual pre-Flashpoint Superman, like with references to Death of Superman and the businessman Lex Luthor and etc. That's what I'm interested in, not a familiar-looking alt-Superman. If you want to get me super-excited and super-disappointed in the span of two lines, call a DC Comics Presents reprint book "Titans Hunt" and then put 1960s Titans issues in it. Obviously, I realized afterward, "Titans Hunt" is a reference to the new series, not the Marv Wolfman storyline. My fingers are still permanently crossed, however, that the Titans Hunt series will inspire a classic "Titans Hunt" collection. 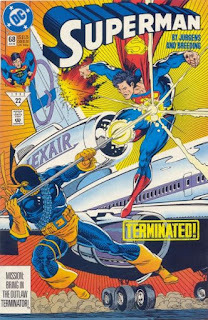 Speaking of exciting "Titans Hunt"-era books, however, this second collection of Marv Wolfman's Deathstroke the Terminator now includes issues #10-13, the Annual #1, and Superman #68 by Triangle Titles extraordinaire team of Dan Jurgens and Brett Breeding. For me that's worth the price of the whole trade. Poor Etrigan cannot get a break, sharing even top billing of this Garth Ennis collection with Hitman. With All-Star Section Eight on the stands, surely DC should just bite the bullet, so to speak, and launch a Hitman revival. The final collection of the weekly series, collecting Earth 2: World's End issues #12-26. The final pre-Convergence collection of the Robert Venditti/Van Jensen run. Three cheers for the continuing Mike Grell Green Arrow collections. This one includes Shado and an appearance by another well-known Grell character, Warlord Travis Morgan. Said to include stories by Jerry Siegel and Geoff Johns, so from start to finish basically, but if James D. Hudnall and Eduardo Barreto's Lex Luthor: The Unauthorized Biography isn't collected here in full, you can keep it. Really good news here for fans of Chuck Dixon's Nightwing, as this third new collection improves on the original Love and Bullets with an unbroken run of issues #19-25 (including Cataclysm and "Brotherhood of the Fist" issues), and the DC One Million, and the Nightwing and Huntress miniseries by Devin Grayson, which was originally collected in a separate trade. Completeness here hopefully suggests more completeness later on. You must be living under a rock if you haven't heard me raving yet about the re-solicitation of John Ostrander's Suicide Squad Vol. 2: Nightshade Odyssey (and apparently a third one potentially on the way, too). I don't know if we ever knew the full contents, but I'm pleased to see this is Suicide Squad #9-16 and Justice League International #13 and the Doom Patrol/Suicide Squad Special. Bringing to a close the Paul Levitz series. In a forthcoming review I'll remark that Levitz's Worlds' Finest has made me less likely to check out his new Dr. Fate series, except that the latter has been getting good reviews. Anyone? OK, so that's what I'm on about. Nice varied list here all around. Tell me in the comments what you're planning to buy. Sadly, Catwoman and Deathstroke books didn't fix themselves (anybody disagree, try to plan following volumes), and that means that's it for me when it to comes to Deathstroke. Catwoman is only inconvenient, because I don't see why it should stop three issues before Infinite Crisis/One Year Later jump instead of having all of Pfeifer/Woods in one book. Also, it was pointed out to me recently, that if you were buying the trades from 10 years ago, you had #1-24 and #53-82. New vol. 3 gave you #25-37, and vol. 4 should give you #38-52, but oops, you need to get vol. 5 for three issues. I'm not sure how readable will be that Nightwing book with parts of 3 cross-overs. Old trade also had #1/2. Love your comments, Marek -- someone's studying these listings even closer than me! In talking about the bigger spring list, you mentioned bad "mapping" of the Deathstroke books. Can you tell me more what you mean by that? Vol. 3 is apparently issues #14-20, which takes us through "Nuclear Winter" (and it'll have only some parts of "Total Chaos," but I think the Deathstroke part was mostly disconnected from the rest). If there's a Vol. 4, let's say that's a little shorter, maybe issues #21-26, and then Vol. 5 is the 8-part "World Tour '93" from issue #27-34. So far I don't see a problem. I get what you're saying about the Catwoman trades (Vol. 5 is said to be #50-61, so if you collected the originals you'd have to get Vol. 5 for four issues), but I guess my happiness at seeing these overrides my upset at having to double-dip on trades released 10 years ago. I can kind of see why Vol. 5 being issues #50-61 makes sense, because it goes through the Film Freak story but before the story turns back to Holly and Catwoman's trip to Metropolis. But yes, that the trades don't fit seamlessly is perhaps unfortunate. On Nightwing, I noticed too that it's missing the 1/2 issue. The book probably won't read well with individual parts of three crossovers, but I think the main interest now is in collecting the whole series, issue by issue, even if those issues connect with other things; I think generally that's what trade collectors want these days. I admit that it might be just my preference, but I'm not buying small trades anymore, and really don't like when series jumps from 10 issues to 7. I see that as bad planning. Especially since there's no reason why Deathstroke vol. 2 couldn't go up to #16. We thought that it's because Total Chaos, but they aren't collecting all of it after all (unless that Hachette listing was wrong - even if it isn't, New Titans #90 and Team Titans #1 could be included as Deathstroke is in them, but especially the latter is mostly back story for Lord Chaos, so I don't know). And then next volume has to be even shorter because of World Tour. Eh. But it can be worse, since #21-25 are not written by Wolfman, DC might actually skip them and go straight to World Tour after Nuclear Winter. Bigger trades also mean going through the series faster and cheaper, for us at least. And rest of Catwoman could be done in three volumes, because it just makes more sense. Especially when you have 15 issues before Infinite Crisis and 30 after. Do they go 15-15-15 (actually, 15-16-14 so that story arc is not split in two books)? No, they go 12-12-oops, there's 21 left, what do we do now. Unless there's something else that should be included, but there aren't any annuals or specials as far as I know. Matt Wagner's Trinity is indeed excellent (I'd be happy to review it). Also, that Demon trade introduces the greatest DC supernatural character of all time: Baytor! He could be DC's Groot if they play their cards right. *Civil War Box Set Slipcase—This covers just about everything, although I’ll bet they were tempted to add in a hardcover of the “Secret Wars” Civil War mini. At least there aren’t any big errors like the similar Secret Wars set including the otherwise unrelated “Silent War”. *Civil War Illustrated Prose Novel—Okay, I’m not sure what this is. From the description it sounds like they’re pairing Stuart Moore’s novelization with art from the actual comic… so it’s a picture book? I guess that’s one way to enjoy McNiven’s art without Millar’s writing. *Daredevil by Miller and Janson and Elektra by Miller Omnibuses—These get new printings for those brought in by the Netflix series. It’s worth noting that the Daredevil one listed is the early material, so if you’re looking for “Born Again” it’s in another book. *Deadpool Classic Omnibus—Post-Joe Kelly, “Deadpool” had a rocky run, and I’d only get this for completionism’s sake. Otherwise just get the Gail Simone-penned “Deadpool Classics” volume and maybe the Christopher Priest one as well. *Amazing Spider-Man: Renew Your Vows TPB—Peter and MJ are back together! This Secret Wars tie-in really feels like Slott making a pitch for the reintroduction of the marriage. Plus it has a glorious return of classic 90s Venom. This trade also collects the “Secret Love” one-shot that sees a variety of fun romantic pairings. *Wolverine: Old Man Logan Vol. 0: Warzones TPB—At this point I’m not even going to question the weirdness of the numbering on this. This is one of the few direct sequels produced during “Secret Wars” and the art is really spectacular. *1872, MODOK: Assassin, Runaways, Weirdworld TPBs—The next wave of “Secret Wars” trades arrives. There are others not listed here that I’ve been following monthly and still others I’m not particularly interested in (like “Years of Future Past”). *Star Wars Legends Epic Collection: Infinities TPB—These are the infamous “what ifs” Dark Horse created a few years ago that see, amongst other things, a redeemed, white-clad Vader and Yoda sending the Death Star plummeting into Coruscant. In other words, I’m kind of surprised that this is getting a Marvel re-release. 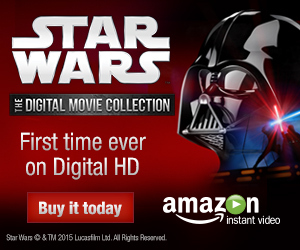 On the other hand, this also includes the fantastic “The Star Wars” adaptation of Lucas’ original script, but you’re better off getting that on its own. *Age of Reptiles: Ancient Egyptians TPB—“Age of Reptiles” has the unique concept of having animal characters and no dialogue. I’ve never gotten into it before but I really enjoy crocodiles, so I might find this one interesting enough to pick up. *Miami Vice Remix Vol. 1—Not all of these 80s comics relaunches have been great, but this one has earned a lot of praise. *Andre the Giant: Closer to Heaven—Andre was one of the most fascinating and iconic athletes of all time, so I’m looking forward to this. Hopefully they include the very true story that Samuel Beckett used to drive Andre to school. *Nothing too interesting this month. Yes on the Trinity review. seconded. that was wagner at his best. I'm amused by Marvel's solicits having Squirrel Girl as "The breakout character of 2015" and Spider-Gwen as "The breakout character hit of the year". Not the same thing, but it really reads that way, particularly since their solicits are right next to one another. Doctor Fate has been enjoyable thus far (I haven't read #3) but the draw for me is Sonny Liew's art, which breathes a good deal of life into Levitz' scripting that may or may not be there otherwise. I didn't realize Liew was on Doctor Fate. He was amazing on "The Shadow Hero" and hopefully this means he'll reteam with Gene Luen Yang on a DC project. A little disappointed with the Nightwing trade. The previous Love and Bullets trade went up to #29. Also, the cover solicited is from #26. I guess DC just wanted to make room for the Nightwing/Huntress mini, since that pairing has become semi-popular in recent comics? Or maybe this is a sign that the Devin Grayson run will be collected, too. I just hope that the next trade doesn't leave out the No Man's Land tie-in. Also, the original subtitle for Dark Knight III was reportedly "Batman and Superman vs the Master Race", but WB seemingly opposed it because they didn't want people to get the idea that Batman and Superman were friends. Yeah, they really dodged a bullet there by shortening it to "The Master Race". I'm not worried that the Nightwing trade doesn't go as far as Love and Bullets because the next volume will. However, as was mentioned earlier, where is the 1/2 issue that was included at the beginning of Love and Bullets. To whom do we complain to get it included here? @HelloThere and David, the next Chuck Dixon Nightwing collection is supposed to include issues #27-34. So whereas this new Vol. 3 takes us to just before an in-title Huntress team-up (not to be confused with the mini), Vol. 4 will take us through that team-up and then to just before No Man's Land. I understand this doesn't track with the original trades, but reading from scratch it does make sense. (And helped by the fact that they're giving this new Nightwing trade a new name, not suggesting they're reprinting the original.) Vol. 5 could be the No Man's Land story, #35-39, and then maybe through to #44 (nine issues total), ending just before "Hunt for Oracle." I'm not sure how essential Nightwing #1/2 is, though I understand we want our trades complete. I actually wondered if DC still had rights to it, being a Wizard comic and all, but I do see that it's available digital on Comixology. A good place to start asking about it (nicely and politely, of course) is Dan DiDio's Facebook page. If the next volume is #26-34, that's just 9 issues, which is a bit on the small side. My guess if that they'll pad it with extra one-shots like the #1/2, or maybe just include the NML tie-in for a meaty 14 issues. Actually, the description on the DC site with the Huntress sounds more like Nightwing #26-29 rather than Nightwing/Huntress #1-4, since the former does take place in the Bludhaven, while the latter (which should happen earlier chronologically) takes place in Gotham, IIRC. I get that the description sounds like #26-29, but I'd be surprised if it wasn't actually the mini since it lists it in the contents. I can't imagine the Endgame issue not being in the Anarky trade because it does follow up that arc.